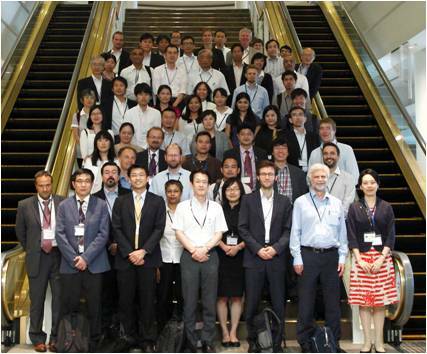 LCS-RNet held its Fifth Annual Meeting on July 22 and 23, and LoCARNet held its Second Annual Meeting on July 24 and 25, at the Pacifico Yokohama (Yokohama, Kanagawa Prefecture, Japan). 81 participants from 18 countries and two international organizations attended the LCS-RNet meeting, while 90 participants from 15 countries and two international organisations attended the LoCARNet meeting. The outcomes of each of these meetings are currently being compiled into Synthesis Reports. These outcomes are expected to be announced and reported at side events of the 19th session of the Conference of the Parties to the UNFCCC (COP19) being held in November 2013 and at other occasions. The meeting recognises that global warming has now moved into the implementation stage for mitigation, where emphasis is put on concrete measures and actions on how to reduce GHG emissions. To make a transition to low carbon society, efforts should be made across the entire spectrum of fields with all stakeholders concerned. In this regard, it has become popular to come together in “knowledge sharing” and to engage in mutual learning activities. There have been attempts to promote dialogue between researchers and policymakers, taking advantage of the Annual Meetings until now and other opportunities. However, it was pointed out that in the future, it will also be important to extract the core priorities among the persons responsible for policy making, researchers, and specialists. This would be in addition to the dialogues that take place at the outcome stage.